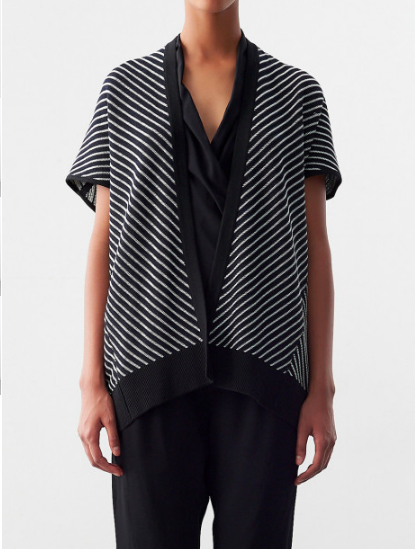 Guys, the Zero+Maria Cornejo online sample sale just went live, and as always, the markdowns are steep and the selection is aces. I acquired this short-sleeved cardigan in the fall, and it is the perfect throw-it-on-and-suddenly-you-have-an-outfit piece. Now it is priced to move, and so are a lot of other pretty delectable items, so do not delay. I know! I’m a tad afraid of the final sale as well. I’ve never tried on any of her stuff. I have a short-sleeved cardigan that is endlessly useful all year long. Who knew? I’ve been eyeing the beetle top, and tempted to purchase. anyone familiar with the sizing, and whether I should order TTS? I've been eyeing the beetle top, and tempted to purchase. anyone familiar with the sizing, and whether I should order TTS? I just emerged from a deep dive into her site- it seems like her clothing is even more beautiful. Her clothing also seems like the type you must try on. (the Jenga pant,the Ero skirt – could be a spot on hit or miss). I can’t believe I’m considering a trip to NYC to so I can try it all on. I just emerged from a deep dive into her site- it seems like her clothing is even more beautiful. Her clothing also seems like the type you must try on. (the Jenga pant,the Ero skirt - could be a spot on hit or miss). I can't believe I'm considering a trip to NYC to so I can try it all on. argh kimfrance!! !